Canadian Rohingya are calling for action as their families face devastation as a result of violence in Myanmar. Warning: Content in this discussion may be disturbing to some listeners. An estimated 270,000 Rohingya Muslims have fled violence in their native Myanmar for refugee camps in Bangladesh, according to the U.N. refugee agency. The violence began on August 25 when Rohingya militants attacked police and military bases. The military responded with a crackdown, saying it has killed at least 400 people, most of them insurgents. For decades, recurring bouts of violence have forced new waves of refugees over the border. Some of those refugees have made it to Canada. Anwar Arkani, who first fled Myanmar in the 1970s and now lives in Toronto, still has family back home. "My siblings are there just sitting there traumatized in Myanmar," Arkani tells The Current's Piya Chattopadhyay. "Villagers are being burned, people are getting shot … mostly beheaded and slaughtered … there are a lot of dead corpses. It's incredibly hard for me to explain to somebody. How can you absorb that information." He says relatives confirm the government is behind the violence. "All these men are armed with machetes and small guns. This is the government policy, openly," Arkani explains. "Security forces come, cordon the entire village, they set fire. Anybody goes out, those they shoot. If the kids [leave], they grab them and throw them into the fire." Ahmed Ullah was born in a refugee camp to Rohingya parents and came to Canada in 2009. He says his family confirms what Arkani describes is happening in Myanmar. "It is it is very accurate and there is actually more going on that I don't think he had enough time to describe," Ullah tells Chattopadhyay. "The government Buddhist regime they just want to wipe us off and they don't want to let us escape and they don't want us to stay there." Arkani demands action against what is happening in Myanmar and says two things need to happen. "Immediately, right now, put some sort of intervention." "Number two, we need a safe zone within the state. This is our planet. We were born here. We have the right to exist." 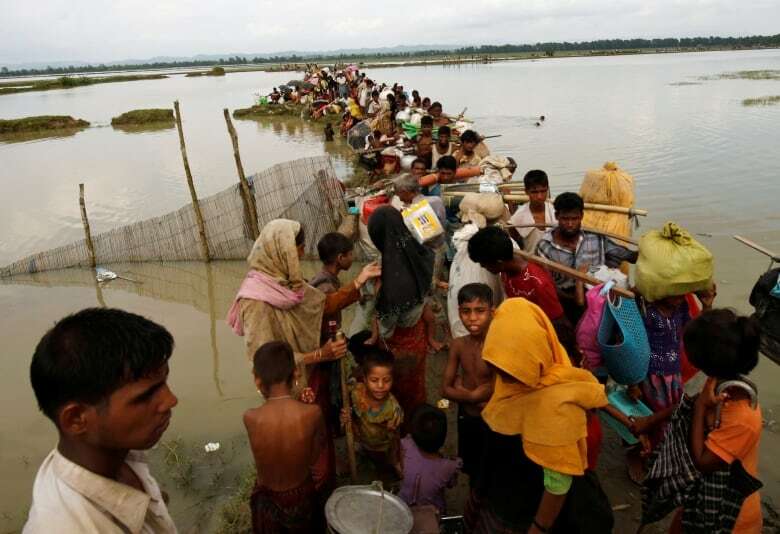 Myanmar's leader Aung San Suu Kyi, a Nobel Prize winner and honourary Canadian citizen, said in a BBC interview, "ethnic cleansing is too strong an expression to use for what's happening … it's Muslims killing Muslims as well." Ullah argues genocide is the cause for people fleeing their country, going to a place where they are not wanted. "If there's no ethnic cleansing why would I want to leave my perfect home? Why would I cry to the world for hope when I have everything." San Suu Kyi was lauded by the Canadian government with an honorary Canadian citizenship. 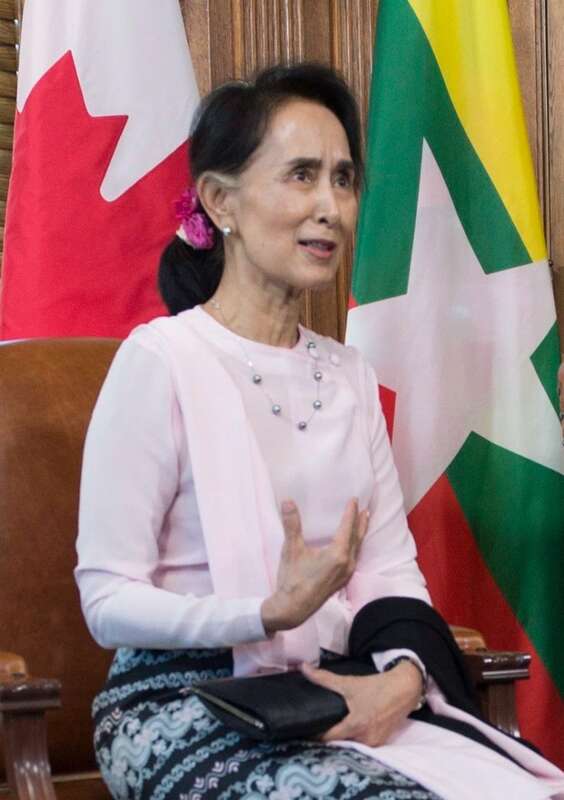 Recently, the government has criticized her for not doing more to stop the violence, but it has committed to sending $1 million in humanitarian assistance to Rohingya refugees. But to Arkani, the Canadian government needs to do more and suggests San Suu Kyi's citizenship should be revoked. "She is is not honourable." He says the Canadian government should also stop providing aid. Ullah is disappointed Prime Minister Trudeau isn't doing more and suggests when San Suu Kyi was in Canada, he should have used his influence. "He could have pressured her and … telling her that you are an honourary citizen of this country. This isn't how you should run your country," Ullah explains. "[Trudeau] should have given her that advice as being a leader of one of the powerful countries in the world." This segment was produced by The Current's Julian Uzielli and Manusha Janakiram. Aung San Suu Kyi: should Canada strip the Nobel Peace Prize winner of her honorary Canadian citizenship?